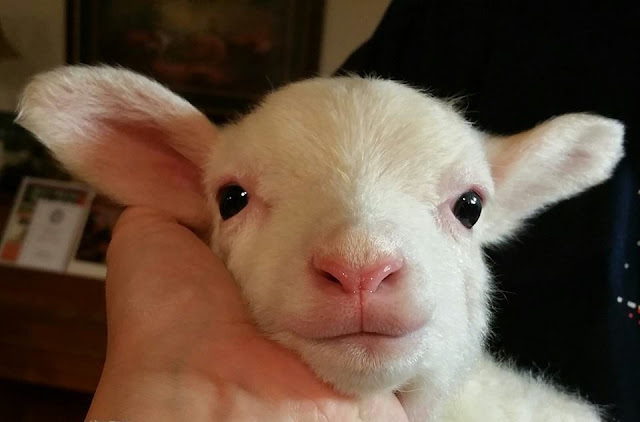 This morn I awoke to baby lamb cries coming from the main room of our house. Pulling back the cozy warm covers took lots and lots of must-do strength. The kind that comes from deep within. Stepping my bare feet to the cool floor I made my way to the cries that called in desperation for their mama. Their mama being me. Mixing their milk, warming it and then swaddling each of them individually in my arms as they drank a concoction they've been so desperately waiting for. After each bottle is quickly downed, I gently cup my left hand around their now full bellies and with my right I give a few rhythmical taps to their side. With little effort, a cough and a big burp bubbles right on out. One at a time I set them back on the farmhouse floor after their morning frantic feast. And then it begins. Running a muck is something a lamb just can't seem to not do. And so it goes. First in circles, then from one end of the room to the other. It's tag, it's leaping, it's back kicks and side kicks. Happiness abounds. Still in my pj's, teeth still unbrushed, hair still uncombed, no coffee yet brewing, sunlight still beneath the earth and sleep still calling my name. I sit patiently while the lambs..be lambs. Their overnight bedding needs to be changed before they can be returned to their napping areas. So in the washer, it all goes. The floor is given a good scrubbing while my hair, ears and pj's all get nibbled on by curious pink lips and budding teeth, I have a constant woolly, hoofed audience. Fresh bedding is put down and lamb bottoms and faces are all spot cleaned. Which then induces another full fledged run a mucking. How anyone else in the house can sleep through a stampede of hooves drumming in the next room is beyond me. That must be a skill I have yet to master. It's clear I may not raise my lambs like some shepherds. And that's okay. It's clear I treat the lambs like the babies they are to me. And that's okay. It's clear I sacrifice much not just during lambing season but much of the rest of the year too, for the farm's sake and especially for my lambs. And that too is okay. As I walk the farm and shepherd walk, I face many things on a daily basis that aren't talked about. And likely aren't noticed by outsiders. In no way could I survive if I wasn't able to choose to be okay. I must be okay with hand raising each of the lambs and also okay with processing them if and when that time arises. I must be okay with it all. Each life experiences and knows love here, from the beginning to the end. I refuse to give up my time with my lambs because it is simply too hard when it comes to time for them to move on. I nurture, I nurse, I caress and I love. This to me is indeed the life of a shepherd. And a farmer. Putting many needs before our own. Even though the end is known, it changes nothing. We love regardless. My hands chapped, callused and worn. My hair a stringy, smelly mess. My milk and poo stained attire leaves much to be desired. But where there is love, it somehow is all okay.